There’s nothing more comforting than a big hearty bowl of seasonal soup to serve during the holiday dinner parties. Leek and Potato soup is such a classic hard-to-beat dish, and makes one of the most creamy soups you’ll ever taste! Serving soup at holiday dinner parties may seem a bit old-fashioned these days, but I have to say, it’s one of my favorite things to serve as a starter whenever I host a large dinner party. It makes dinner prep a lot simpler, plus it’s nicely filling whist still being very light. 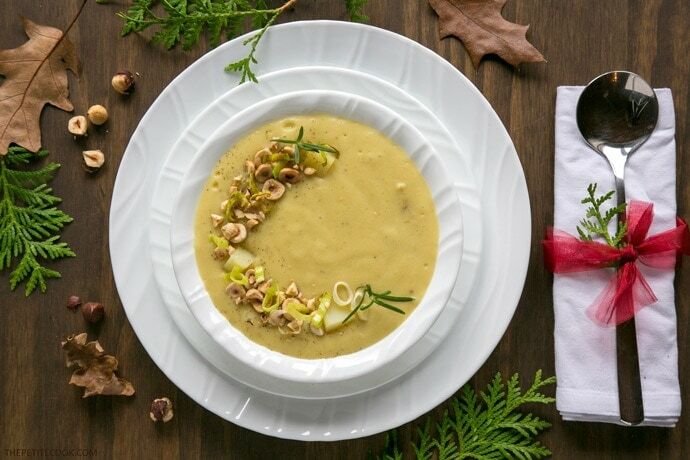 So this year, I’m planning to serve this heart-warming vegan Leek and Potato Soup with Toasted Hazelnut at one of my annual holiday gatherings. Leeks, fluffly russet potatoes, toasted hazelnuts: these are a few of my favorite things. And really, they are all you need to make this soup. Just add in onions, some herbs and spices and you’re good to go. You can finish off the soup with a dollop of fresh crème fraîche for a nice contrast and extra creaminess. To keep it dairy-free I usually leave crème fraîche and simply add a little more stock if necessary. Turning an everyday soup into a gourmet dish is really easy. All it takes is just a tiiiny bit of effort to display some pretty decorations on top, and a refined and elegant dinnerware. For this recipe I’ve partnered up with World Kitchen, to show you how upgrade a classic recipe and turn it into a restaurant-worthy dish to impress your guests. 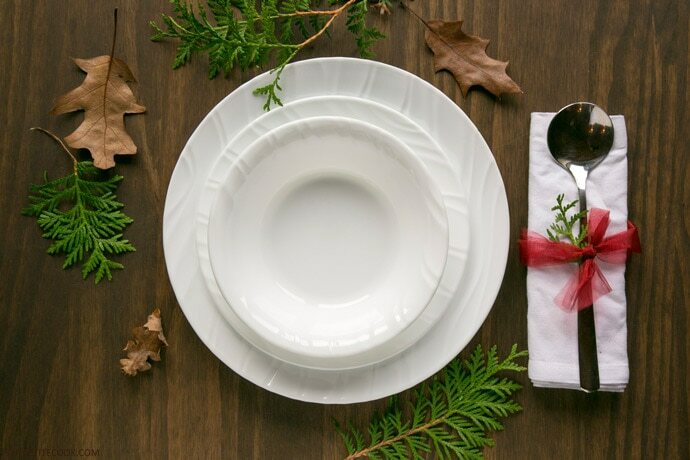 I’ve used Corelle Boutique Swept Dinnerware, which is part of their new collection. This set, made with unique vitrelle glass, is elegant and beautiful and will work with virtually any kind of dishes you’d like to serve to your guests, plus it’s chip, break & scratch resistant, simply perfect for all your large dinner parties. Back to this awesome vegan leek and potato soup with toasted hazelnut, I’m sure it will make a fantastic entrée for your holiday dinners – it’s super easy to make, and conveniently gluten-free and dairy-free, so you can please as many guests as possible at your dinner table! 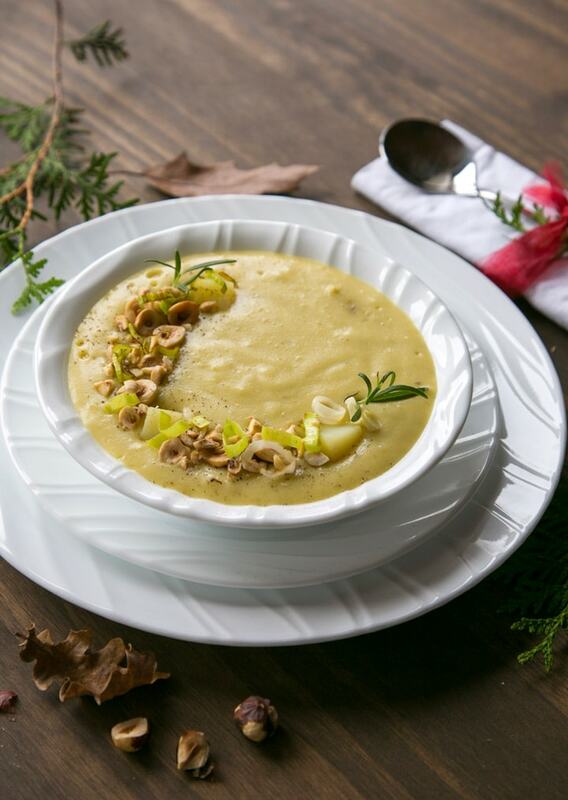 Leek and Potato soup is such a classic hard-to-beat dish, and will make a great starter for your dinner parties! This version is also conveniently vegan, gluten-free and dairy-free! Fold in bay leaves, thyme and rosemary and season with salt and white pepper. Pour in stock and cover with a lid. Bring to a light boil, then lower the heat and cook with the lid slightly on the side for a further 20 min, or until veggies are tender and cooked through. In the meantime, heat a large skillet and toast the hazelnuts for about 3-5 mins, until lightly browned, then cut into halves and set aside until ready to serve. Take out bay leaves, rosemary & thyme sprigs, and a handful of leeks and potatoes. Adjust seasoning, add creme fraiche if using, then blend the soup with a hand-held immersion blender until smooth. If the soup is too thin, simmer again until thickens, if the soup is too thick, just add some extra stock. 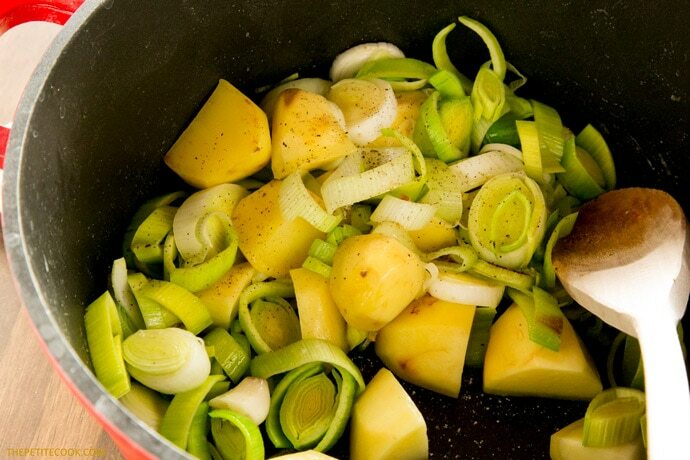 Divide the soup into bowls, then chop the reserved leeks and potatoes, and top each soup with chopped leeks, 3-4 potato cubes, chopped hazelnuts and extra rosemary & thyme leaves. Season with white pepper and serve immediately. This post is sponsored by World Kitchen, and as usual all opinions are my own. I’ve been regularly shopping at World Kitchen, and can only recommend it to all of you! Thank you for supporting the brands that support The Petite Cook.